Boots, Class, and a Bit of Sass! 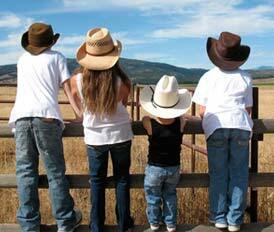 We invite you to join us at all four of Leduc Black Gold Pro Rodeo's 50th Anniversary events! Check out these other wonderful events going on up until the big weekend! 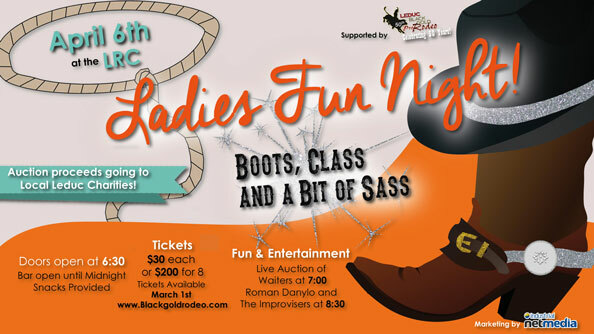 Come join us at Ladies Fun Night, celebrating the Leduc Black Gold Rodeo's 50th Anniversary with the proceeds going to support Local Leduc Charities! Come party, have some drinks, and many great laughs! Bring your Boots, Class, a Bit of Your Sass to this awesome event! To purchase your tickets for this fun-filled event follow the link above. When the screen loads click on the button that says "Register Now." From there, follow the Registration Instructions. You must purchase on-line tickets, on the date of the event hard copy tickets will be available to pick up! On-line ticket confirmation (Printed or Electronic) along with photo ID MUST be presented at the door by the person the tickets are booked under or to whom they were gifted. No Refunds/Exchanges. If you are purchasing single tickets, please buy as a group to be placed at an 8 person table together. Tickets are $30 dollars each or $200 for a table of 8! Ladies Fun Night will have Live Entertainment and other fun activities! Get your table ready to bid on "auctioned off" waiters that will be "sold" to the highest bidding table! For the rest of the evening , your waiter will serve your table! Bid on great items with the proceeds going to deserving Local Charities! Have a chance to win our exciting 50/50! Star of CTV's Comedy Inc. and a cast of some of Canada's best improv comedians. Join in on the fun! We are excited to offer you and/or your company an opportunity to get involved. WAITERS: We are looking for men to "auction off" as waiters (for a portion of the event's tables). Men will be "SOLD" to the highest bidding table. We encourage you to step forward for a bit of training and a whole bunch of fun! No experience is required or necessary. All funds raised from the "Waiter Auction", will be donated to Leduc & District Emergency Shelter Association! All tips received by the waiters, during the event, are yours to do with as you wish! SILENT AUCTION (Donation) ITEMS: Everyone knows that times are tough. We are asking you for your assistance in achieving a successful and profitable Silent Auction! Your donations (big or small) will make a difference in giving back to our Community! All funds raised from the Silent Action, will be donated to Riseup Society Alberta! VOLUNTEERS: We are looking for a variety of volunteers for all types of jobs. You must be 18+ years of age. You will get to attend this event for FREE....while making this event a success! Please contact Jen at jlborgel@shaw.ca or call 780-914-8327 for more information.